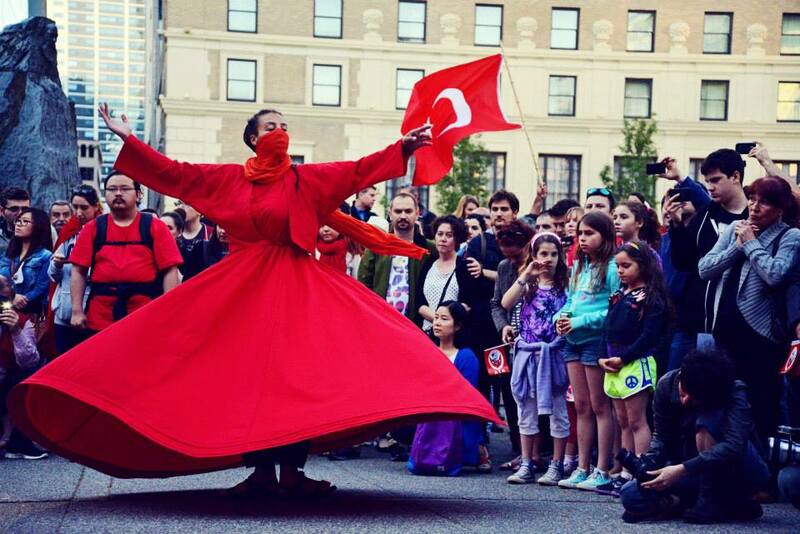 On Monday hundreds of people, including many Turkish Vancouverites, gathered outside the Vancouver Art Gallery in solidarity with the ongoing protests in Turkey. Addressing the broad anti-government protests in Istanbul and throughout Turkey, speakers at the VAG condemned the Turkish government’s undemocratic tactics, police brutality against the protests, media blackouts, and religious fundamentalism. Some organizers drew attention to the original event that sparked the movement. “What started everything was a public space, Gezi park in the city centre…The government decided to turn that into a shopping mall and that wasn’t even a lawful decision. There’s a court decision against it,” said Ozgur Sapmaz, a volunteer organizer of the rally at the VAG. Despite the distance between Vancouver and Turkey, the events in Gezi park bring to mind local history. There was the fight to save the entrance of Stanley Park in 1971, the Crab Park occupation in 1984, the successful UBC student campaigns from 2007 – 2009 to stop the privatization of the centre of campus and the UBC Farm, the Olympic Tent Village, Occupy Vancouver, and many other squats and tent cities. If the destruction of Gezi Park — a seemingly innocuous and unexceptional event — can spark such an uprising in Istanbul, could the same not happen here? Many have wondered how and why the movement to save Gezi Park set off the uprising. Was the threatened destruction of Gezi Park simply the final straw in a series of government blunders, or was it more than that — the place of multiple overlapping contradictions. How was the struggle for Gezi Park capable of explosively symbolizing a mass of issues and grievances? These words resonate in Vancouver, a city quietly yet quickly in the process of being transformed into a resort for the wealthy — but not without a fight from low-income Vancouverites, marginalized communities and renters. Sapmaz says that there is a growing understanding that corporate cronyism and oligarchy are driving the rapid gentrification of Istanbul. “In the grander scheme of things, there are a lot of guys who have become really rich under this prime minister’s government over the past 10 years — lots of major contractors, kind of similar to Vancouver in that regard, how major contractors tie into government. They are known to support the ruling party’s political campaigns during election time,” he said. The ruling party of Turkey also controls Istanbul’s City Hall. It is within this context of neoliberalism and rampant privatization that the Gezi protesters gathered the courage to fight the government in the centre of town’s tiny park. “To resist for the sake of a single tree,” reads a placard in Istanbul’s Taksim square, “is more honourable than to beg for a barrel of oil.” The park was small, but the analysis of, as Cemal Burak Tansel puts it, “state-driven privatization projects which fulfill the double enactment of surplus absorption and the closure of public spaces” was big. And hundreds of thousands of people were ready to fight to make that point. On the one hand, it is true that police brutality caused the protest to become widespread. It is not enough to say, however, that the brutality itself was the spark. The fact that the government responded with such force to the events in the park also suggests that they recognized it was a symbolic place worth fighting for. Is it possible that the struggle in Istanbul is, at a deep level, connected to struggles in Vancouver, with poor people and renters displaced to enrich the corporations and their corrupt governments? Sapmaz described the general economic environment in Turkey as “privatizations everywhere, everything has been sold. As people are protesting right now on the street, the government passed a law and gave foreign oil companies the right to search in forest lands. This is only two days ago, and parliament got together and passed this law at midnight. No one could even discuss this.” Significantly, he noted that the Vancouver-based mining giant Goldcorp is active in Turkey. Many attribute the current social crisis to the bulldozing efforts of the Turkish Housing Development Administration (TOKI), which has pursued decade of aggressive neoliberal housing reform. TOKI was established in 1984 with the purpose of building affordable housing, but it’s role in the development of housing was insignificant until the election of the neoliberal AKP government in 2002. At that point, TOKI’s was adapted to serve private interests, and in a short period it’s national production share of new housing supply rose dramatically, from 1 % in 2003 to 18% in 2012. In Istanbul alone, TOKI has now built over one hundred thousand new units (no count of how many have been demolished in the process). The problems now surfacing with TOKI are many. None of the TOKI units are built at public or social housing rates, despite TOKI’s claim to the contrary. According to an unpublished report by urban researcher Aslı Sarıoğlu, “about 80% of TOKI’s construction projects in the greater Istanbul area are built for high income groups,” and many of the developments are high-end luxury. TOKI buildings are financed through Public-Private Partnership schemes whereby TOKI sells state-owned land at less than its actual market price to private developers. “This works as a hidden subsidy to the developer,” writes Ozan Karaman. In turn the developers are able to sell the units for “less than its competitors in the market,” allowing the developers to make a handsome profit while failing to produce systemic affordability. In short, all the factors of recent housing policy in Turkey are present in Vancouver: the transfer of public land to private developers, state subsidies for those developers, and an overall policy that claims to build “affordable” housing while in reality constructing market units. A similar relentless pattern has emerged in Vancouver, where the demolition of affordable low-income housing makes way for luxury housing, producing a net loss of affordability. If the people of Turkey can see the connection between these various forces, perhaps we can too. Corporate cronyism, gentrification, speculation, eviction and displacement, racism, environmental destruction, top-down decision-making — these are all part of daily life in Vancouver, the city with ever-worsening poverty and the lowest corporate tax rate in the world. Posted in #occupyvancouver, Environment, Gentrification, Public Expression. Bookmark the permalink.